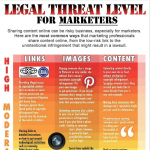 This graphic ranks various content-sharing activities from low-risk to probable infringement. Your best bet? Get consent for everything. While the graphic isn't pretty, the contents within provide valuable food for thought. Ever wanted to send out a few questions to the subject matter experts you admire to get their thoughts for a blog post but have been too afraid you'd come off looking like a slacker? I know I have. It turns out that people don't see this as being lazy at all! In fact, it's actually probably more work to compile the results but you get the benefit of outside opinion. Research always pays off. Take a look at this post from SEO Chicks for more great info. Next time I crowdsource a post you bet I'll be asking Julie Joyce for her thoughts... nicely. Always ask nicely. 2012 social media darling, Pinterest looks like it's growing up fast with a redesign "coming soon." Social Fresh takes us through some of the main updates as well as "sponsored pins" which will soon be served up. Will this be a welcome change for die-hard pinners? The new changes really put content discovery at the center of the user experience, as well as opening up a clear vision for marketers on the platform. You may have heard recently that Twitter released a new video app called Vine. Chris Brogan jump starts our brainstorming for business applications with this neat little app. We're already cooking up some fun ideas for this with Kapow Events. Have some neat ideas of your own on how businesses can use this? Let us know in the comments below.